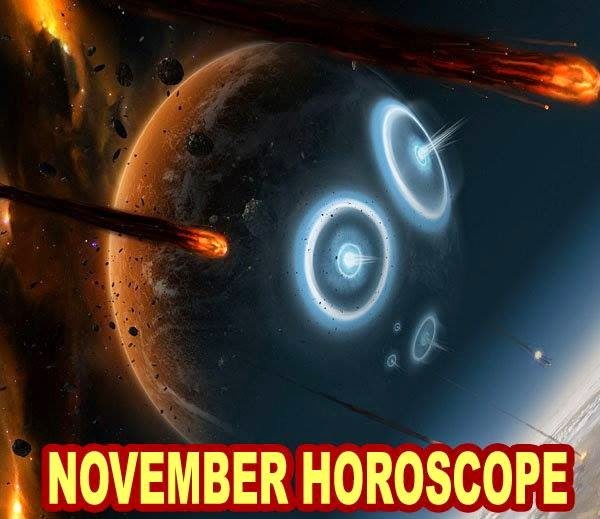 Astrological Prediction for November 2014 Month, November 2014 Horoscope for All zodiac sign. For all the visitor of astro upay, here is the monthly prediction for all zodiac sign for the month November 2014. here is monthly astrology prediction for November 2014. Aries: It is better to do work patience. However luck is in your favor. You will be dedicated to your work but you have to active regarding your respect and prestige. If you will face problems in your personal life then you must have to take advice from someone or younger brother. You have to drive carefully. You must have to take care of your health. Taurus: The starting of the month will be good. But you have to make control on your speech to get peace in personal life. You have to be very careful in financial matters. You will get rid of from old problems due to good effects of Sun. Your enemy will be quiet. You may get promotion if you did hard work. Gemini: You may get too much angry. You have to control it. You have to maintain the relations with your friends and brothers. This time is also not good for love relationship. You will not get too much benefit from short journeys. However you will get rid of from your problems in the second half of the month. You will get success after doing hard work. Cancer: You may not get good results in the first half of the month. You have take care in the financial matters. You have to control on your speech. You will get good result after doing hard work. The second half of the month would be better. However you have to take care in every matter. You have to drive carefully. Leo: You may get good results in the first half of the month. However you have to take care of your health. You must have to avoid conflicts with your close friends. You have to maintain your confidence. The situation will be in control. You may have family problems in the second half of the month. You must have to remain tension free. You have to drive carefully. Virgo: The starting of the month will be not too much good. But you will get good results after doing hard work. You may have family problems. You have to take care in financial matters as well. You will get rid of from your problems in the second half of the month. You will get good benefits by journey. Libra: You might get good results after doing hard work. Your health may disturb. Your speech may be disturbed. You have to keep patience. You have to control on your speech in the second half of the month. You have to be very careful in the financial matters. Scorpio: You may have expenses in the first half of the month. You will not get good results from the journeys. Do not work in hurry. You will get good results in the second half of the month. You have to avoid too much work and take care of your health. Do not get angry on someone. Sagittarius: The starting of the month will be very good for you. You will get benefits from your journeys. You may go on spiritual places. You may face some problems but if you do little hard work then you will get success. The second half of the month will be expensive. Do not go on unnecessary journeys. You have to take care of your health. Capricorn: This month will be good for you. You may have some difficulties in job/business. But you will get success if you do work with patience. You have to take care about your prestige and respect. You will get more benefits in the second half of the month. You will also get money and benefits from journeys. You may go on business journey. Aquarius: You will get mixed results in the starting of the month. You must have to take care of business journeys. You have to concentrate on your personal life. You must have to take care of your parents. The second half of the month will be better and financial problems will be solved. You will get success in work. Pisces: The sun is not beneficial in the first half of the month. So you may face some difficulties. You will get success with your luck, energy and zeal. You have to be careful from sudden problems. Problems will be solved in the second half of the month. The financial position will be better. You will also get support from your relatives.